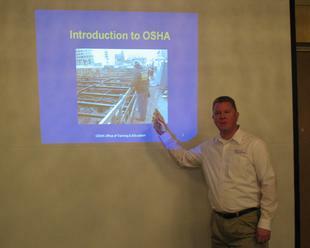 Per OSHA - All OSHA 10-Hour classes are to be conducted over 2 days. This OSHA 10-Hour Outreach Safety Training program, which is a 2 day course, is designed by OSHA for construction workers, foremen, job supervisors and anyone involved in the construction industry. The goal of this OSHA 10-Hour Outreach Safety Training course is to help employers and employees identify, avoid, prevent and control hazardous situations in the work place. Considered "the standard" in the construction industry, this OSHA 10-Hour Outreach Safety Training provides a strong foundation upon which employers and their workers can build a safe working environment. This safety awareness class could help reduce or eliminate employee injuries, workers' compensation claims, potential lawsuits, property damage, and the need to hire and train replacement workers. & the safety of others on the job. OSHA plays in worker safety. to his employer and himself. understanding of safety in the workplace. Class Location: Safety Equipped, Inc. offers training throughout North America and on a regular basis at locations in Massachusetts, Rhode Island, Connecticut, New Hampshire and New York. Private Sessions: Safety Equipped, Inc. will conduct a class at your business location or at a location convenient to you and try to work around your production schedule. OSHA 10 is a lifetime investment in the safety of your employees. OSHA 10 cards currently do not have an expiration date. Click on the (Calendar) tab to view the schedule for Open Enrollment class dates and locations. To sign up for any of our classes, click here (Registration Form) to open and print the registration form or call Safety Equipped, Inc. at 508-332-8959. Pre-Registration is Required for all scheduled classes.